If you're looking for day trading strategies that work then this video is going to go into a high level overview of momentum trading strategies aka day trading. One video can't go into all of the specifics of day trading since it's such a vast arena of trading, so make sure to take our free day trading course if you need more help after watching this video. If you’re looking for day trading strategies that work, how to day trade stocks and what’s the best trading strategy for intraday breakouts then this article will break down some of the fundamentals to getting started. Before we get started breaking down day trading techniques that work…it’s really important to know the brutal truth about becoming a day trader. It’s HARD! In fact, learning how to day trade stocks is going to become one of the hardest undertakings of your life. The failure rate as a momentum trader is over 90%! That’s right…you’re joining an industry where the odds are completely stacked against you. If you’re looking for day trading secrets then this is a good one for you. You’re about to join a club where you’ll be trading against the best traders in the world. That’s a scary secret right?! Make sure to check out our in depth video on how to day trade stocks below. We really highlighted the overall big picture of how to day trade stocks and what it takes to become a profitable day trader. We’re sorry to start this post out with a negative connotation but we wanted to give it to you straight. That’s what we’re about in the Bullish Bears community. BTW…if you haven’t joined our trading community on Facebook yet then either click the banner below or go to our stock market community. Now that we’ve gotten the tough love out of the way…let’s talk a little bit about day trading strategies that work. If you want to become successful with day trading strategies momentum then one of the most important things to keep in mind is that proper risk management strategies will be the key to your success. Ideally, you want to have at least a 2:1 profit/loss ratio. Never risk more than you can potentially make! If you’re looking for successful intraday trading strategies then it’s best to look for chart setups that have potential daily breakouts. The best day trading strategies that work usually come with daily breakouts. We use Trade Ideas as our stock scanner of choice to find our potential plays. Their scanner ROCKS! Limit orders are much safer to use than market orders when trading. They protect your entries and exits whereas market orders are a much riskier because you don’t know what your fill is going to be. Feel free to check out our limit order vs. market order video to learn more. Level 1 & level 2 and time and sales show the breakdown of buyers vs. sellers. They have a symbiotic relationship and work in partnership with each other. It’s important to always be aware of how many buyers and sellers are looking to potentially enter and exit a trade. There’s lots of manipulation that happens with level 2 so that’s why it’s important to always keep an eye on time and sales. Learning how to draw support and resistance levels stock charts is critical to your day trading success. Traders are creatures are habit and finding proper support and resistance levels is essential. Exponential moving average and simple moving average lines are important indicators that traders pay particular attention too. They tell an important story on all chart time frames. One of the best day trading secrets that we can give you is to watch for the 9/20 ema crossover. If the 9 ema points wards and pushes price up then you could ride the 9. *NOTE: The pic above on CREG is a 1 min. chart that shows the 9 ema crossing over the 20 ema a little after 9:45 am. It broke high of day of $6.33 around the same time. On that green hammer pullback to the 9 ema, you could have take a position on the break above that hammer. Then rode it to the 1st close below the 9 ema. This strategy alone would have yielded you close to a $2.00 per share profit. Join our stock market training community of fun traders that cut through all the nonsense of the stock market and love to help you make money investing. Vwap is another important day trading indicator than many traders pay attention to. It’s right up there with ema’s and sma’s. If you’re looking for trading strategy examples then make sure to check out our YouTube channel and watch our watchlist videos. We have a lot of good content on our channel. The gap and go strategy is probably the best trading strategy for intraday. The reason why this strategy is so popular is when a stock moves pre-market there’s a chance that it might run at the open. Hence the term gap and go. A stock is essentially gaping above the previous days close price. Learning how to buy the dip and trading red to green moves are also really popular intraday strategies. 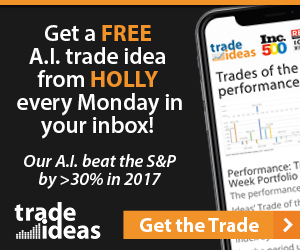 We use Trade Ideas every single morning to find our gap and go plays and share our Trade Ideas stock scanners live each day in our trading service. Red to green moves are many times great day trading strategies that work. This strategy is when a stock goes up above the previous days close price. Many of times a stock will have further continuation up when this happens. Again, we use Trade Ideas to find these setups. Believe it or not…many traders use the Ichimoku Cloud Trading System for day trading strategies that work as well. We could go on forever on day trading strategies that work but the most important thing that you could do is join our community and trade room. Learn from our community of traders. Take our free trading courses below. Watch all of the great content on our YouTube as well. But…most importantly…make sure that you’re ready to do the hard work that’s necessary to becoming a successful trader. Proper mindset is key! Thanks for bullishbears website, it is a great place to learn, thank you for all your efforts.